Emeli burst onto the scene in 2009 with Top 10 hit ‘Diamond Rings’, her stunning collaboration with Chipmunk. She scored further chart success with DJ and rapper Naughty Boy before claiming her first number one – the smash-hit ‘Read All About It’ with Professor Green. Her multi-platinum-selling debut album ‘Our Version of Events’ catapulted Emeli to worldwide acclaim, before her ‘Live At The Albert Hall’ album also topped the charts. In 2012, Emeli performed at both the Opening and Closing ceremonies of the London Olympics. She won two Brit Awards in 2013 for Best British Female Solo Artist and British Album of the Year. Emeli‘s second studio album ‘Long Live the Angels’ – featuring the global smash-hit single ‘Hurts’ – was released in 2016. In 2017 Emeli received the Brit Awards’ Best British Female Solo Artist award, becoming her fourth win in total, while she was appointed Member of the Order of the British Empire (MBE) in the 2017 Birthday Honours for services to music. 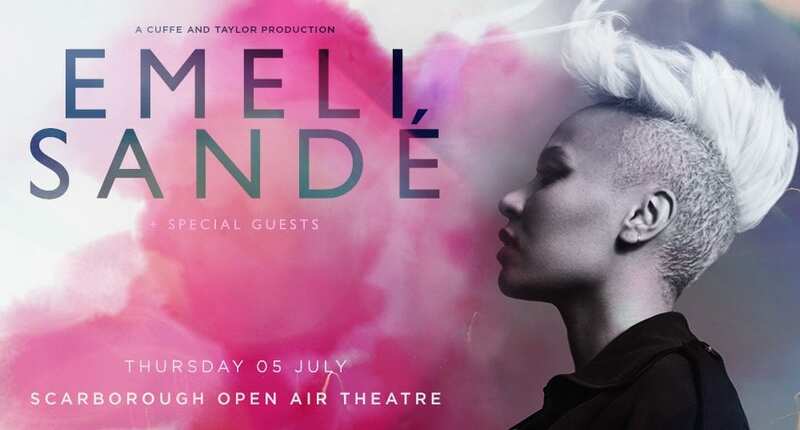 Emeli‘s show at Scarborough Open Air Theatre is presented by Cuffe and Taylor. Director Peter Taylor said: “What can be said about Emeli Sandé which has not been said already? She is a global star whose songs have touched millions of people around the world. Emeli Sandé join a stellar line-up at Scarborough OAT this summer which includes not-to-be-missed shows from Britney Spears, Noel Gallagher’s High Flying Birds, Lionel Richie, Pete Tong and the Heritage Orchestra’s Ibiza Classics, Nile Rodgers and CHIC, Bastille, Il Divo, Gary Barlow, The Script, Steps and Alfie Boe.